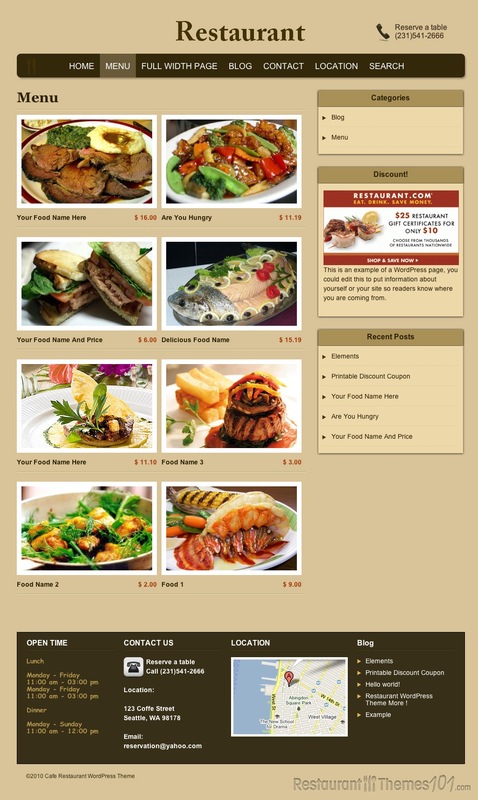 Restaurant is a sleek, simple WordPress theme for restaurants, coffeebars, etc. Developed by Clover Themes, Restaurant offers a variety of features and tools that will benefit restaurants of all shapes and sizes. 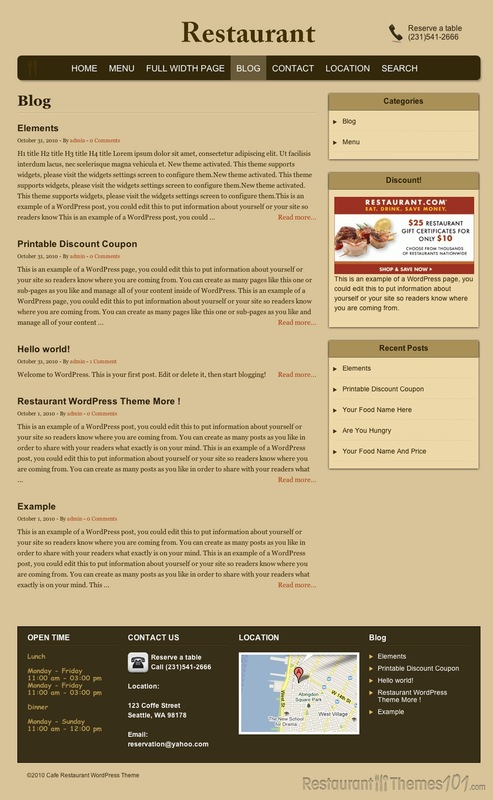 This theme is similar to the coRestaurant theme from the same developer, with a few slight tweaks to the design and functionality. 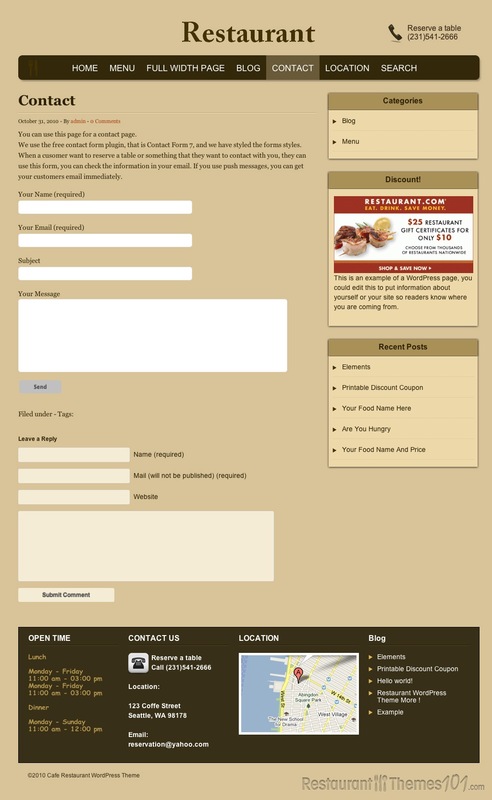 When you try out the demo, you will notice that at the top of the page this theme highlights the phone number of your restaurant at the top right. Under that, you will see a series of links. These links are drop-down capable, meaning you can have subtext show under the main text when a visitor hovers their mouse over the link. The standard page links are Home, Menu, Blog, Contact, and Location, but any of these can be changed to fit the needs of your business. One unique and useful feature of the Restaurant theme is that on the bottom of the page, all the important info, such as your location, phone number, and hours are all listed clearly and obviously. This will allow people to quickly and easily access your site, and get the information they need, without having to “dig”. 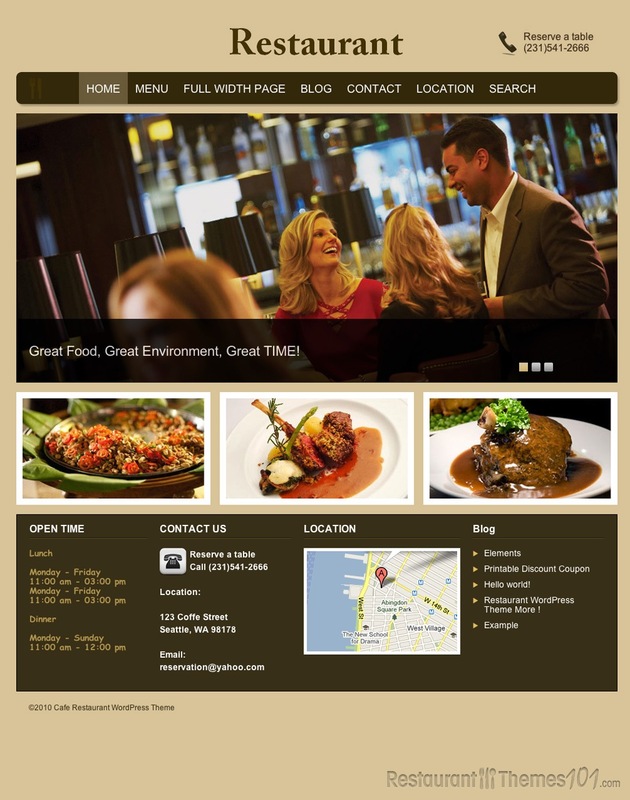 The theme can also implement Google Maps, so that your visitors can get a visual representation of where your restaurant is located, instead of just an address. Restaurant also offers a customizable search engine, which can be useful if you have a large menu, or if you have multiple locations. This theme is also highly search-engine optimized, which will make it easier for your site to rank for popular local search terms. In short, this theme has just about everything you could ask for, and will work perfectly for any restaurant, large or small.